In addition to fully synthetic Mobil engine oils, high-performance Mobil transmission and rear axle oils, greases and specialty products for commercial vehicles can help deliver further advantages to fleet operators – including fuel economy benefits. Through innovative drivetrain designs, today's manual transmission and rear axle technology have vastly improved the performance capabilities of heavy-duty trucks in terms of load, torque, speed and control. These designs have increased the requirements of lubricants to deliver higher levels of performance, increased productivity and reduced operating costs. For heavy-duty final drives, friction control, wear protection, thermal stability, shear stability, rust and corrosion prevention and seal protection are lubrication features that must be optimally balanced. This enables an oil to provide long gear and seal life, smooth operation, improved fuel economy and high-load, high-torque capability over a wide range of applications. 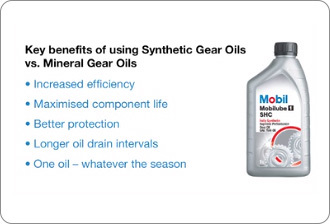 In response to these advancements, ExxonMobil has developed Mobilube 1 SHC 75W-90, a fully synthetic, supreme performance commercial vehicle gear lubricant to deliver outstanding performance and reduce lubricants related operating costs in heavy-duty drivetrains. For a fuel economy evaluation, the test on Mobilube 1 SHC 75W-90 was conducted using a 440 HP Volvo FH13, a 6x2 tractor loaded to 38 tonnes with i-Shift transmission. The drive cycle was derived from long-term data-logging of long-haul, heavy-duty truck operations in Europe and the testing was conducted on track at MIRA in the UK. A fuel economy benefit of up to 1.2% was measured when comparing the synthetic product to these mineral oil based products. Fuel economy improvements are dependent on vehicle/equipment type, outside temperature, driving conditions and your current fluid viscosities. With fully synthetic drivetrain lubricants having the potential to enable companies to run their vehicles more fuel efficiently and for longer, operators who currently outsource their maintenance and servicing, should ‘ask for synthetics’ the next time their vehicles are taken into the workshop. Call El Zahed for more details on the Mobil Delvac range of truck engine oils and Mobilube 1 SHC 75W-90 as a synthetic transmission oil.